I love hanging this huge heart in my home for Valentine’s Day, but it’d also be great for a photo backdrop at a party or wedding…or as the backdrop for a Valentine’s themed pug photo shoot (note to self!). And scroll to the bottom to see how pretty it looks hung in front of a window. The sunlight shoots through and details the circle overlay, which it is absolutely beyouutiful! If only our apartment had big enough windows to accommodate the giant heart! 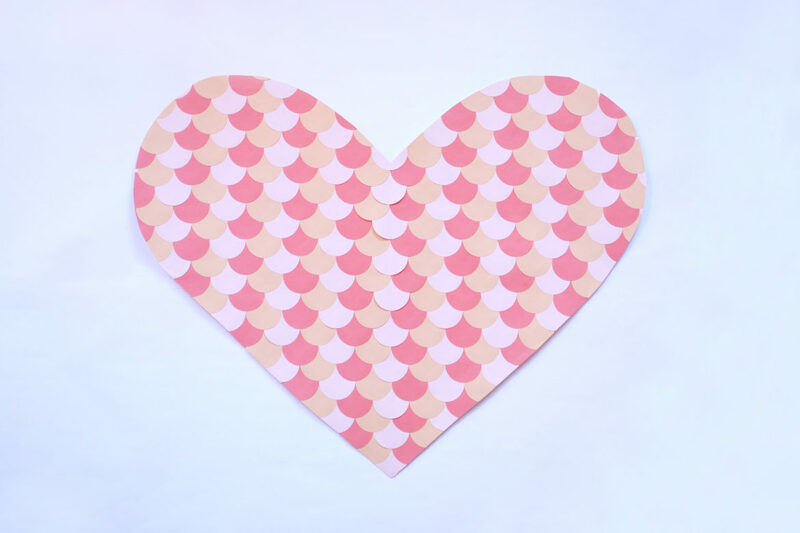 Step #1: Select your preferred paper colors for your scalloped heart. Step #2: Once you have your punch and your paper colors ready, punch away! For my backdrop that was 4′ wide, I needed around 60 circles of each color. 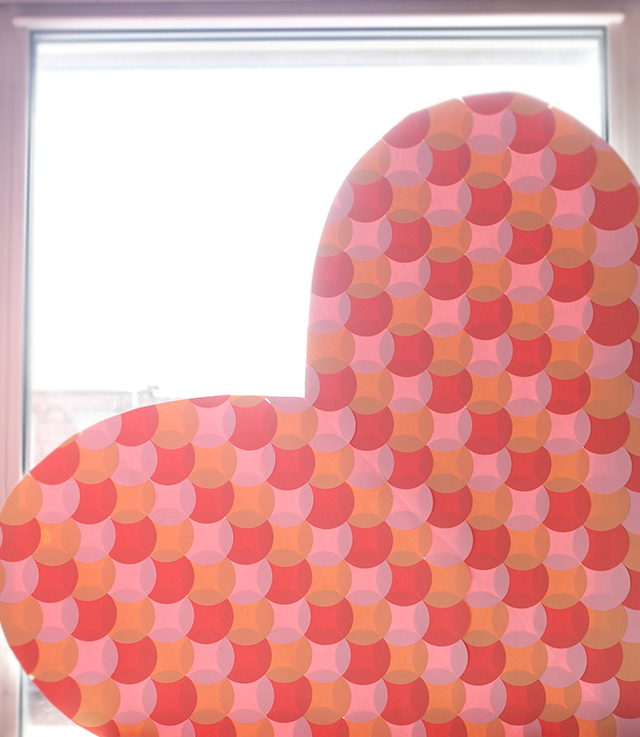 Step #3: For the heart backdrop, take a large piece of butcher paper and fold it in half. At the fold, trace half of a heart, and then cut along the line. When you unfold the paper, you’ll have one large heart. Step #4: I alternated my colors, but if you are using more than 3 colors, you’ll probably want to randomize the order. 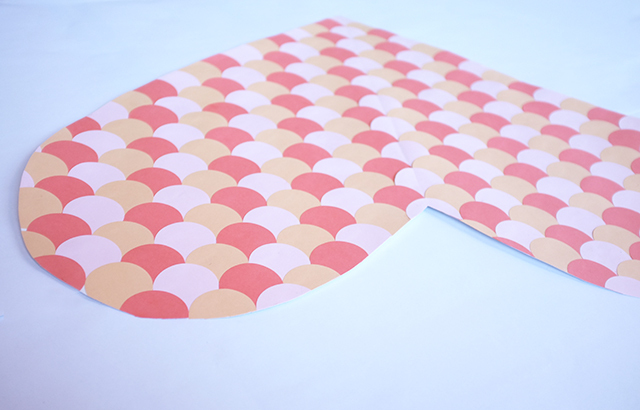 Once you’ve planned out your pattern, glue your first circle at the bottom of the heart. Moving upwards, place the next row of circles up (if you want to be exact, go up half the distance of the diameter of your circle). Continue up your heart, gluing each new circle in the middle of the two circles below it to create the scalloped effect. Keep a ruler handy to ensure the rows do not go askew. Step #5: Keep adding those circles! Step #6: Once you’ve covered the butcher paper with scalloped circles, turn the heart over and trim along the original edge of the backdrop. 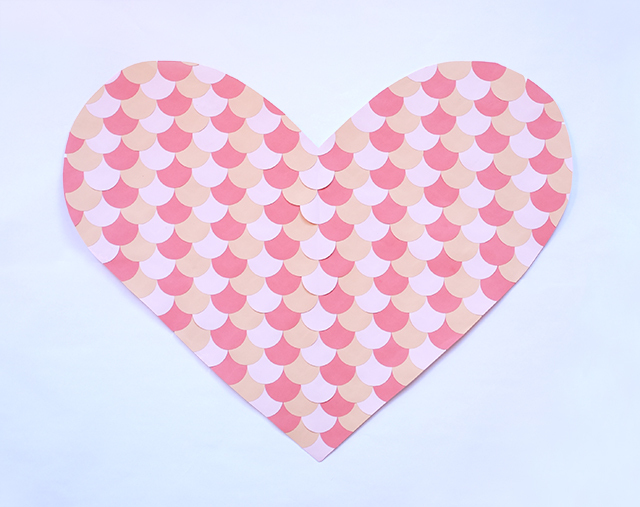 And voilà, your paper heart backdrop is ready for use. What a cute idea! I love how the light shines through when it’s by the window. I loved meeting you at ALT. Such a treat to talk with you… your blog is beautiful and full of wonderful ideas 🙂 I wish you all the best and hope to meet again. 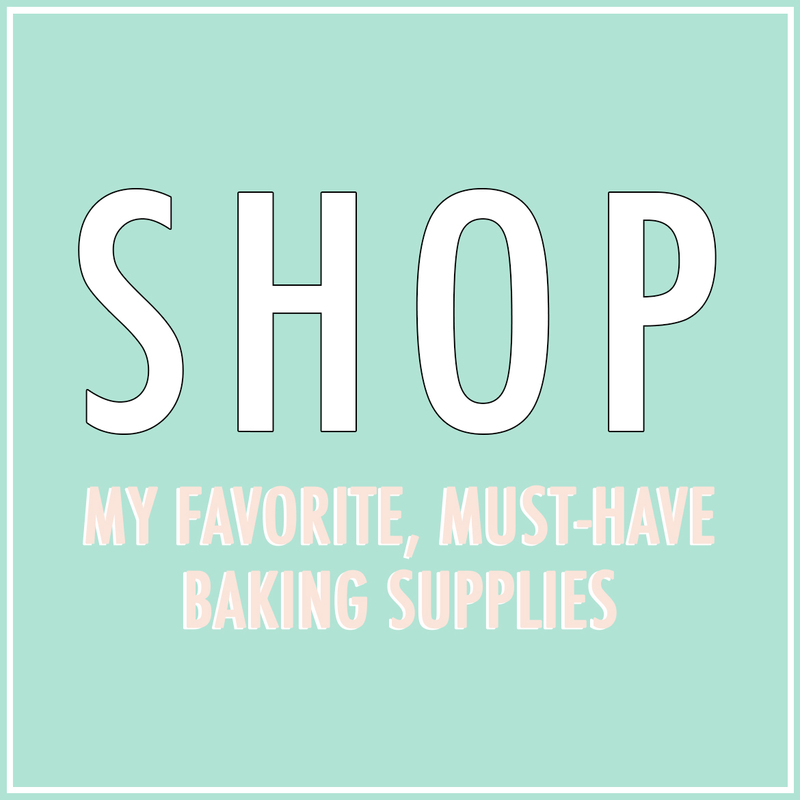 I am totally making that arrow cake for my family this valentines! Awww Laurie – I was JUST thinking about you yesterday! It was so awesome meeting you and getting to know you. Keep in touch! Hope you’ve connected with the ulive team! You’d be so great!! I love this!! could you advise what size circle punch you used? Many thanks. thanks so much! i used a 2 and 1/4 inch punch.